Ahead of Saturday's 11:30am deadline, we will be combing through all 20 Premier League press conferences to bring FPL managers the need-to-know team news, injury updates and predicted XIs for GW23. 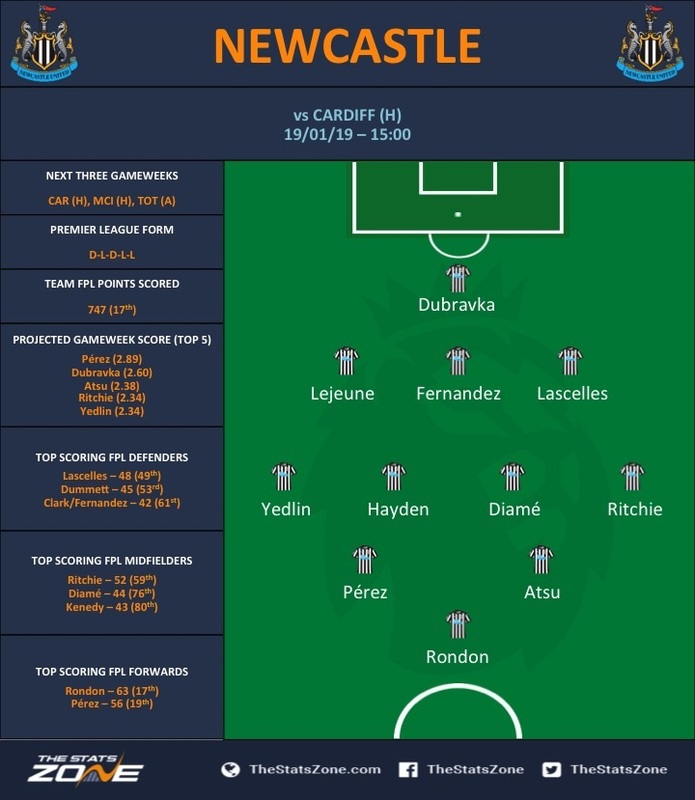 The Stats Zone's other Gameweek 23 FPL content includes Captain Picks, Fixtures, Projections & Team TSZ Discussion. We also have two featured pages which will be updated regularly, so make you sure bookmark them! With Aaron Ramsey (£7.2m) being used sparingly, Alex Iwobi (£5.4m) may start in attacking midfield again. 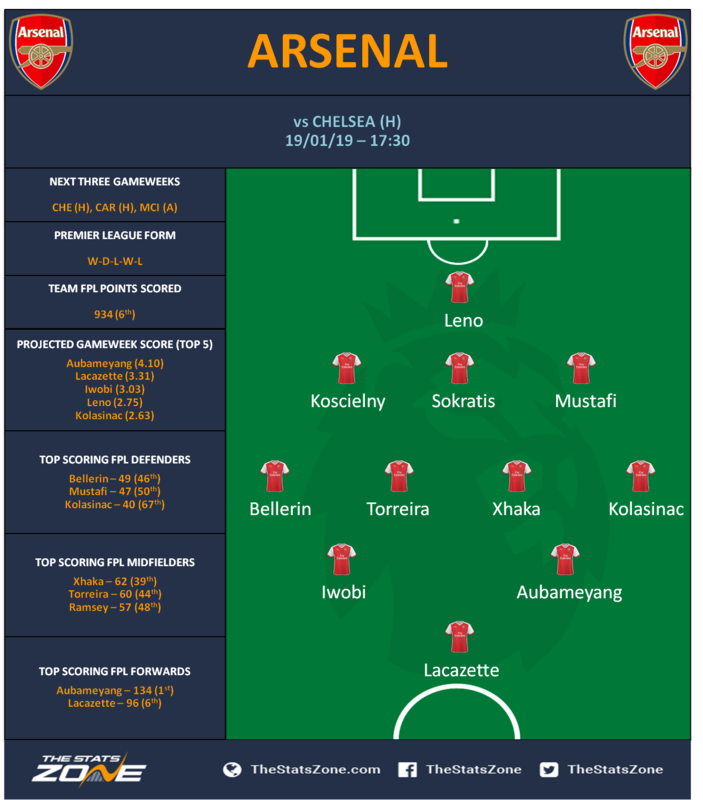 Lucas Torreira (£4.9m) might expect to make Emery’s XI ahead of Matteo Guendouzi (£4.4m), though both midfielders could begin the game alongside Granit Xhaka (£5.3m) if the Spanish boss wants more protection in midfield. That 3-5-2 system could see Iwobi or Alexandre Lacazette (£9.3m) - who has only made one start against a top-six side this season - drop out. Hector Bellerin (£5.4m) could be ready to begin the match against the Blues after making his comeback from injury in the 1-0 loss to West Ham last weekend. A late decision is set to be made on the availability of Callum Wilson (£6.5m) with Eddie Howe saying that the striker's hamstring injury was a "little bit more serious than the club initially thought” before going on to add that the player “is a quick healer and has been working hard, so we’ll wait and see.” If the English international doesn’t make the squad, expect Howe to play the same front combination as last week, where David Brooks (£5.1m) played in behind Joshua King (£6.1m). 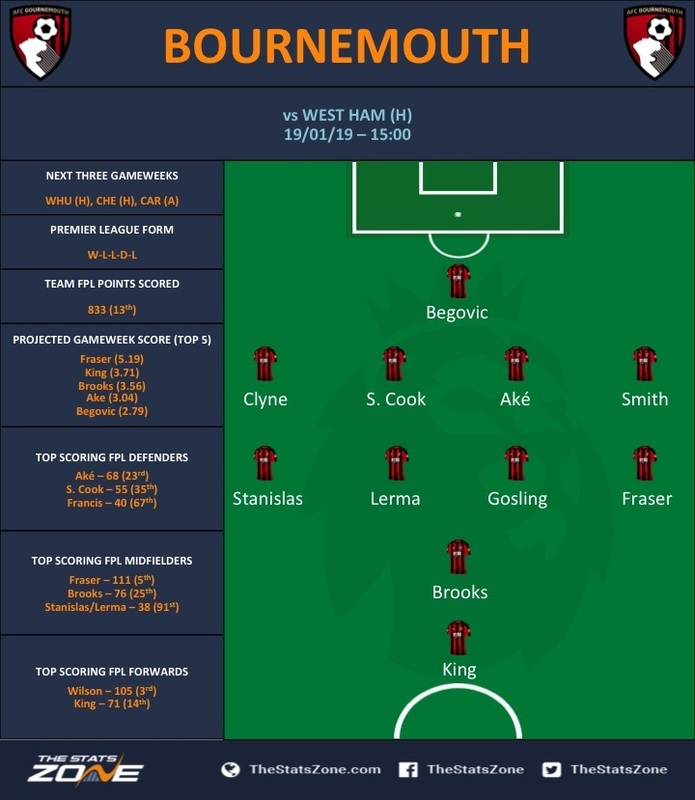 Other than the news about Wilson, Howe has no new injury concerns with both Simon Francis (£4.3m) and Lewis Cook (£4.7m) still the only major long-term casualties. New signing Dominic Solanke (£4.7m) is not expected to feature until next month: "Dominic will miss most of January. He's got a bit of a hamstring issue so it will be more February before we're likely to see him in action." Pascal Gross (£6.7m), who gave away the penalty that saw Brighton lose 1-0 to Liverpool in GW22, could be under threat for a start if Bissouma is passed fit. Beram Kayal (£4.4m) is a further midfield option. 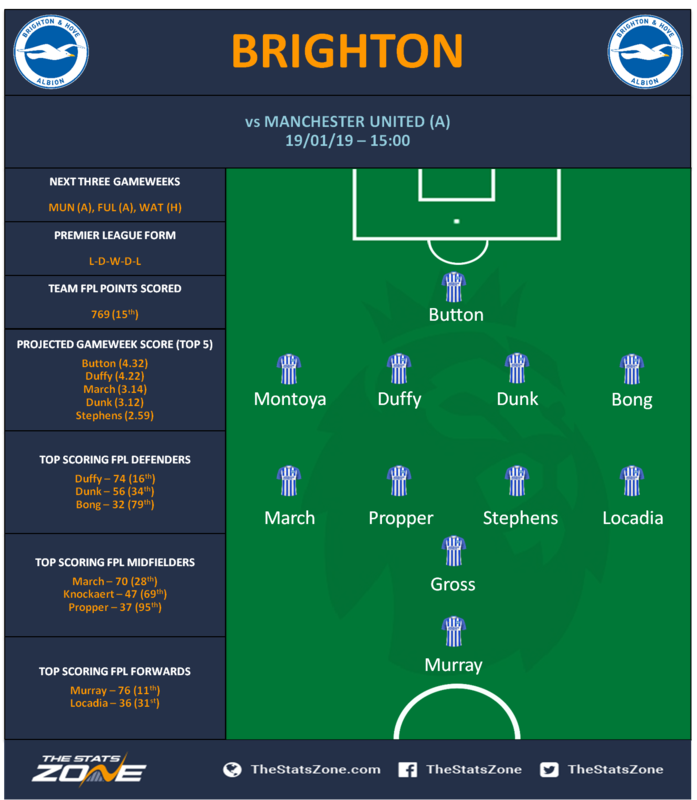 Florin Andone (£5.0m) will continue to challenge Glenn Murray (£6.3m) for the striker’s role in Hughton’s XI. Alireza Jahanbakhsh (£6.7m) and Mat Ryan (£4.4m) remain on international duty. Johann Berg Gudmundsson (£5.6m) is doubtful for GW23, while Nick Pope (£4.8m) is not yet match-fit. 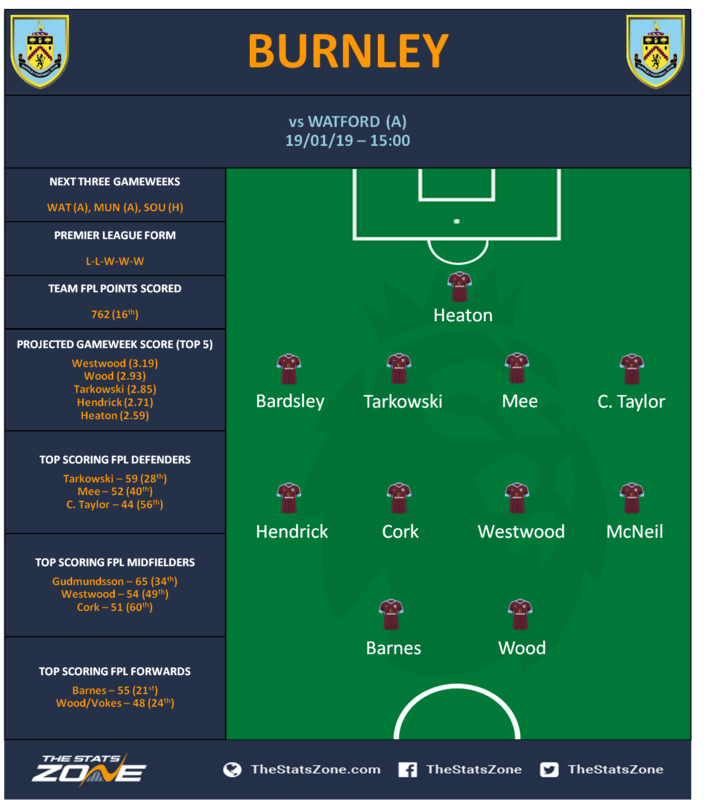 Jeff Hendrick (£5.2m) looks set to continue in wide midfield after being the orchestrator of Fulham’s two own goals in Burnley's 2-1 win last Saturday. Robbie Brady (£5.4m) serves the final game of a three-match ban. The club have today (Friday 18th Jan) confirmed the loan signing of Senegal international Oumar Niasse (£5.0m) from Everton until the end of the season. The forward is unlikely to be available for the match this weekend against Newcastle but will no doubt start pushing for minutes in the near future, a situation that may jeopardise the fantasy appeal of current ‘out of position forward’ Callum Paterson (£5.1m). Another striker that could further muddy the Cardiff striking waters is Emiliano Sala (not in FPL) who is due to have a medical. On the injury front Warnock has concerns over three of his players: “I would like to tell you but I’m not 100 per cent sure about anything at the minute. There’s three lads having fitness tests, I know that.” Following the game against Huddersfield Victor Camarasa (£4.6m) and Paterson were struggling with muscle injuries after Huddersfield. The pair may not be risked depending on who else is available. 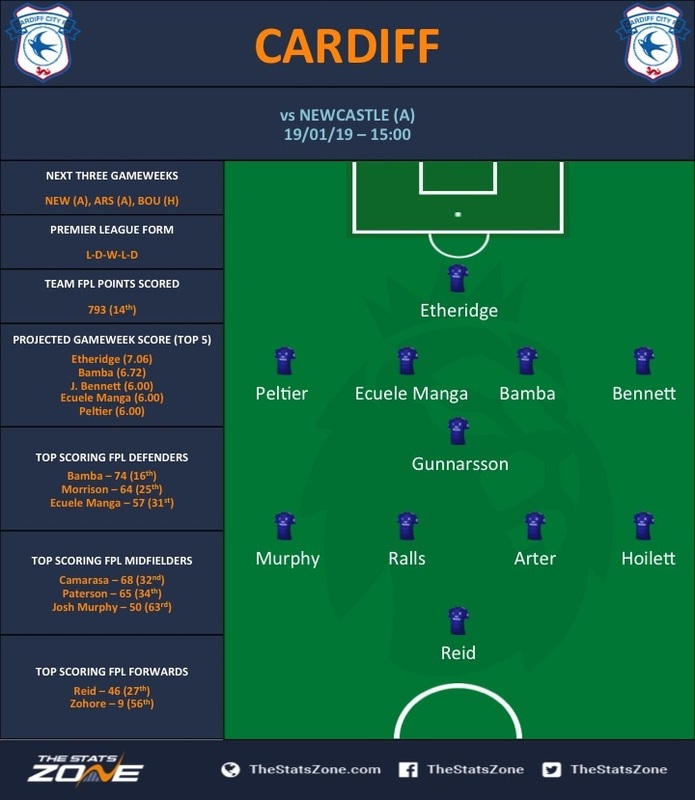 Joe Ralls (£4.6m) will be looking for a recall to the starting XI if Camarasa is out. Bobby Reid (£5.2m) could replace Paterson up top. Sean Morrison (£4.7m) is a major doubt for the weekend with Warnock stating, “I don’t think (Morrison will play tomorrow), but if there’s any doubt I won’t play him anyway. We can’t gamble on anyone.” With Morrison likely to miss out Bruno Ecuele-Manga (£4.4m) could move across to centre-half, then, with Lee Peltier (£3.9m) brought in at right-back. Chelsea have a nearly fully fit squad to choose from for the upcoming London derby against Arsenal. Only midfielder Ruben Loftus-Cheek (£5.2m) is out with a back injury. Olivier Giroud (£7.7m) is another option but Sarri wasn’t exactly glowing in his assessment of the French forwards chance to start: “I don’t know, we have to decide. 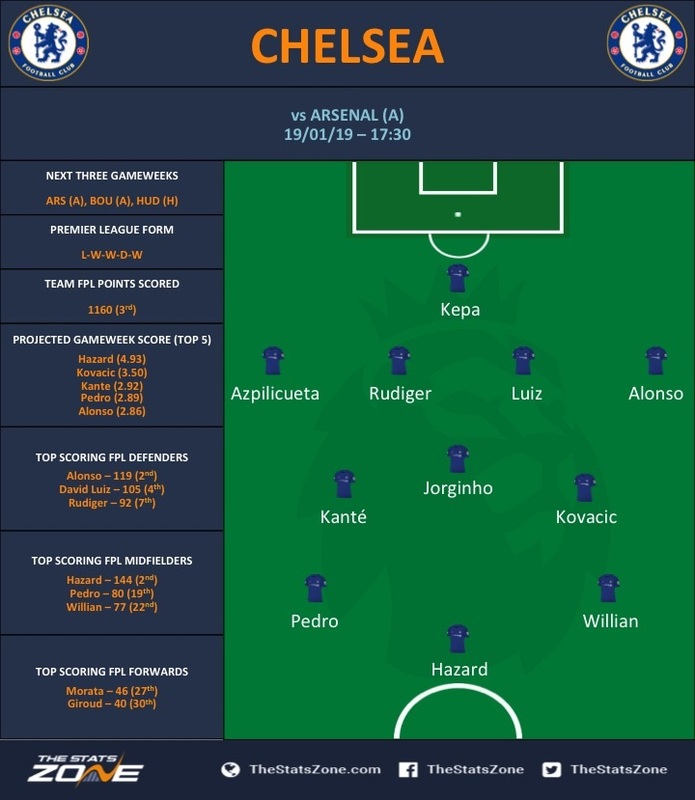 I think Giroud in the first six months played often, we need our team to be balanced on the pitch.” Given the news on Giroud and Morata, Eden Hazard (£11.1m) is a good bet to start in the false nine position again. Third choice goalkeeper Julian Speroni (£3.9m) is set to don the gloves this weekend with both Vicente Guaita (£4.2m) and Wayne Hennessey (£4.5m) still recovering from knocks picked up last time out. On the matter Hodgson stated,: "Both goalkeepers are out. There aren't any other injuries to report. We haven't got a timescale but they are working hard. We are fortunate that we have a goalkeeper of Speroni's quality and experience." Other than the keeper crisis and Pape Souaré (£4.2m), who is out for a number of weeks following a dislocated shoulder, Hodgson has a fully fit squad to choose from. Expect Christian Benteke (£6.3m) to get some minutes from the bench as he continues his return to full fitness. Asked about the positioning of Richarlison (£6.9m), Marco Silva said, “Like you know, Richarlison can play out wide or as a striker. I know every three or four matches if he doesn't score, the same conversation will come again. 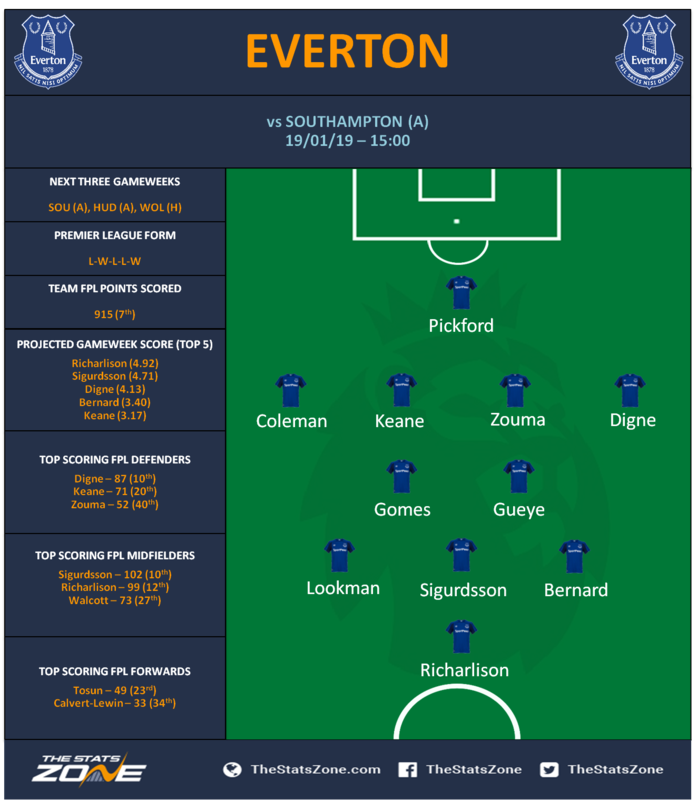 He feels as comfortable in that position [striker] as he feels out wide.” If the Brazilian is moved to the wing, Dominic Calvert-Lewin (£5.3m) could earn a start, while Ademola Lookman (£5.1m) may continue in Silva’s XI if Richarlison remains up front. Phil Jagielka (£4.3m), who has managed 53 minutes all season, is Everton’s only unavailable player. 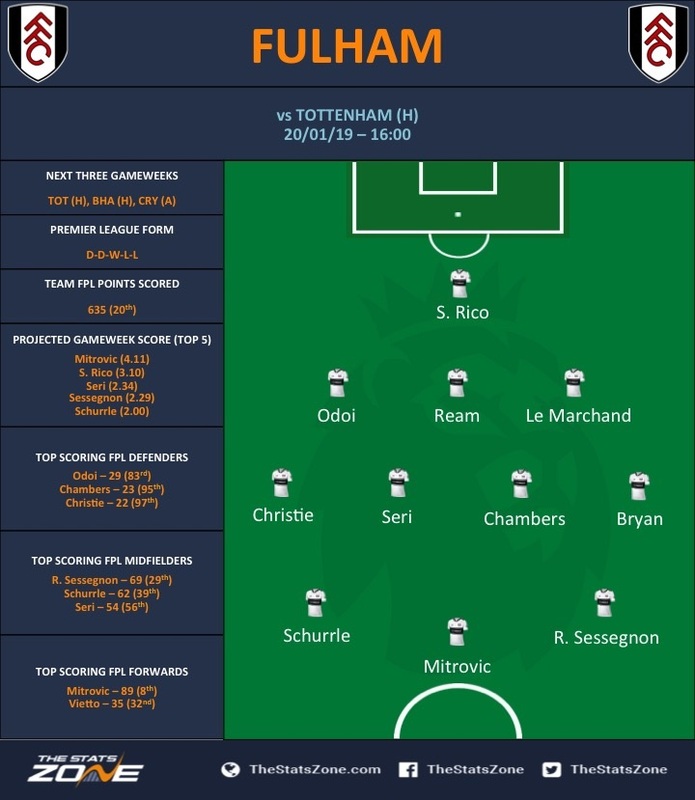 Ranieri has confirmed that Fulham have “no new injuries” ahead of the weekend clash against Tottenham. Alfie Mawson (£4.8m) is set to miss out once again with a knee injury, while Zambo Anguissa (£4.4m) remains a doubt. Mark Hudson will take charge of Huddersfield for the first time this weekend following the shock departure of David Wagner on Monday evening. Hudson will be given a baptism of fire as the Terriers host Manchester City in the early Sunday kick-off. The interim boss has reported no new injury concerns for the Terriers so Danny Williams (£4.5m), Abdelhamid Sabiri (£4.3m) and Aaron Mooy (£5.1m) remain the trio in the treatment room. 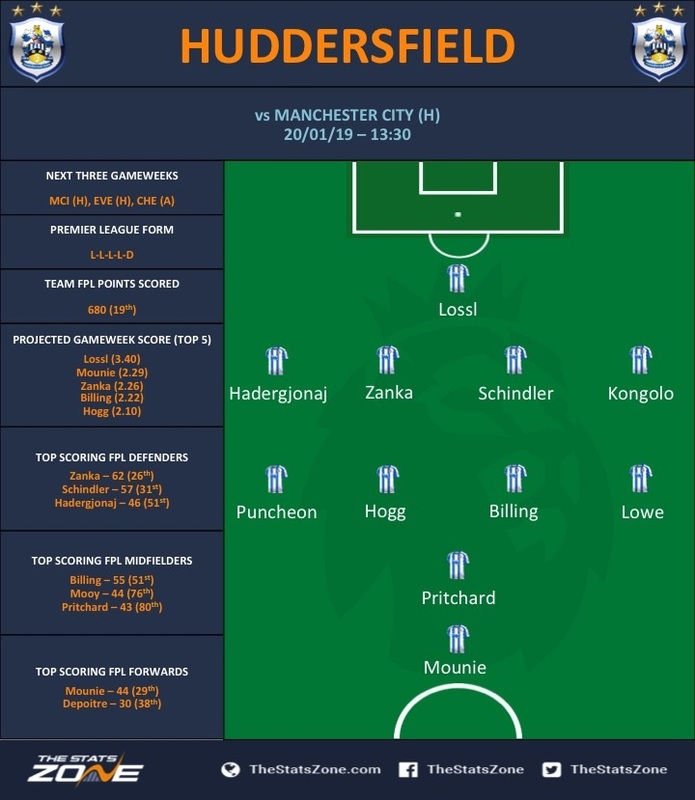 The visit of the Champions may see Huddersfield take a more defensive approach. Terence Kongolo (£4.3m) will be looking for a recall at left-back, while Chris Lowe (£4.4m) may be positioned ahead of him in to give Town some added protection down the left hand side. On the right side expect to see Florent Hadergjonaj (£4.3m) at right back with Jason Puncheon (£4.2m) stationed ahead of him. Jonny Evans (£4.8m) could return to the Foxes’ matchday 18 this weekend. Claude Puel said, “Jonny Evans can come back in the squad. It was not a serious injury and I think he will be in the squad on Saturday.” The French manager has no other injury concerns, with Daniel Amartey (£4.3m) a long-term absentee. 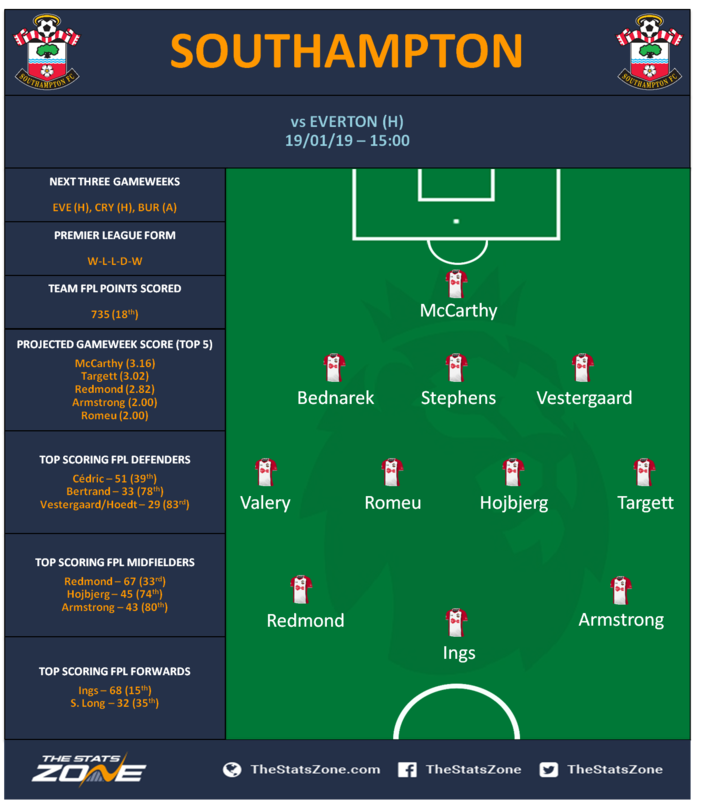 Having been beaten 2-1 by a ten-man Southampton in GW22, Puel could be tempted to alter his starting line-up. 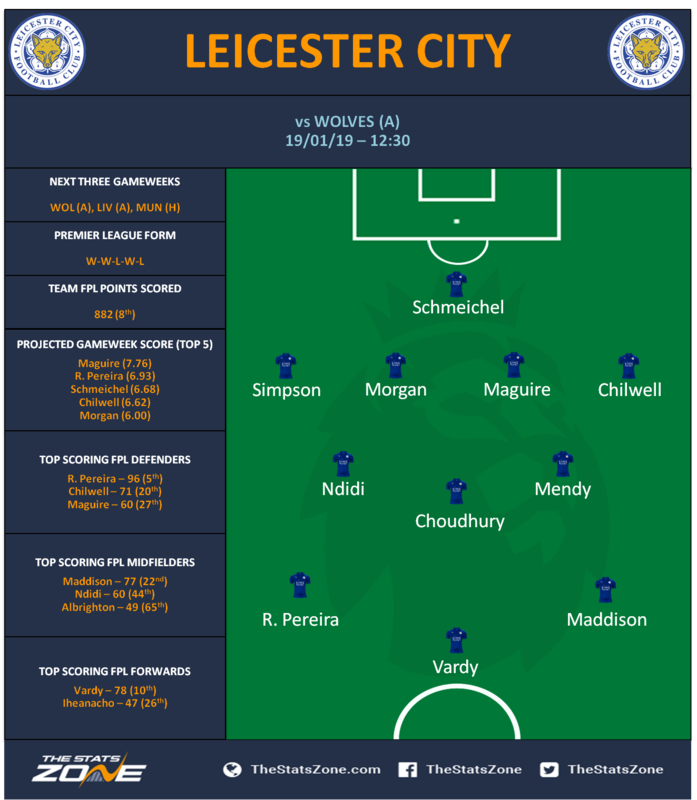 Ricardo Pereira (£5.3m) has been a potent attacking weapon for the Foxes in recent gameweeks and could move further up the pitch, while Demarai Gray (£5.4m) is one of several Leicester attackers that will be pushing for inclusion. Jürgen Klopp has given an injury update on his squad. Despite reports that had ruled Trent Alexander-Arnold (£5.2m) out for a number of weeks, Klopp has stated that both he, and Georginio Wijnaldum (£5.5m), have a chance of playing this weekend: “For both, it will be really, really close for tomorrow. I don’t want to close any doors before anybody tells me I have to.” Should Alexander-Arnold be unavailable, James Milner (£5.6m) could come in at right back, while club captain Jordan Henderson (£5.3m) will be hoping to keep his place in the middle of the park. Both Adam Lallana (£6.9m) and Joel Matip (£4.9m) have returned to full training. 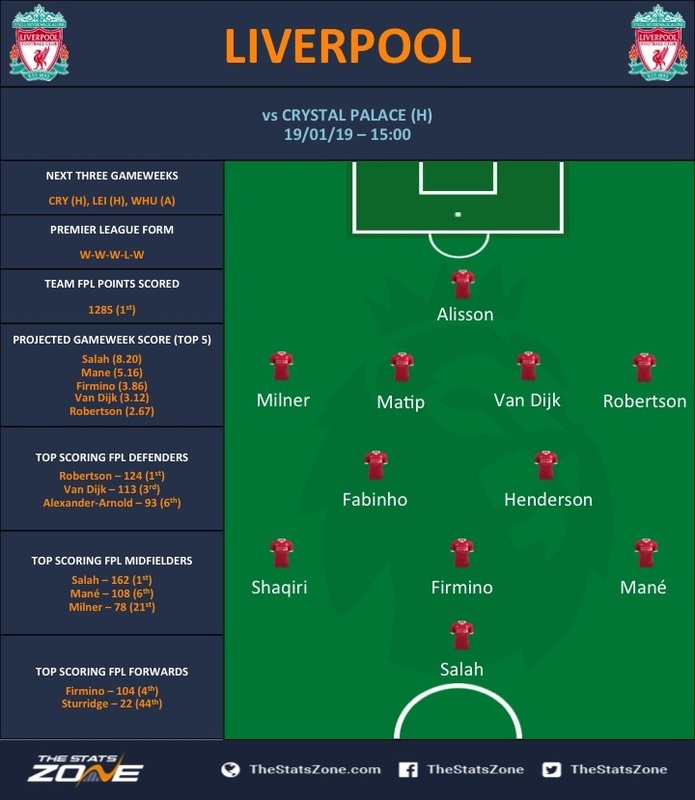 Of the two Matip is the most likely to step straight into the starting XI at the heart of the back four. The City boss has given an update on Benjamin Mendy’s (£6.2m) recovery saying, “Mendy is not ready for this weekend, but he is closer. He has had a third or fourth training session with the team and it’s going well, but now it’s time to get him back in the best condition." With Gabriel Jesus (£10.1m) hitting form and Sergio Aguero (£11.2m) fit again following injury, Pep has been asked on a potential selection headache when it comes to picking between the two. His response to this: “No problem. We’re going to play one of them or both of them - no problem at all. Everybody is going to play. We have a lot of games.” Sadly there was no indication on who might play this weekend. Kevin De Bruyne (£9.7m) is another that will be pushing for a start as he continues his path to full fitness following injury. If Pep does decide to start the Belgian midfielder any one of David Silva (£8.5m), Bernardo Silva (£7.6m), Raheem Sterling (£11.3m) or Leroy Sane (£9.6m) could be at risk of being rotated out. At the back, United’s defence are starting to return to a full complement with the return of Eric Bailly (£5.0m) from suspension. Marcos Rojo (£4.9m) and Chris Smalling (£5.6m) remain sidelined but both have resumed light training this week. Moussa Sissoko (£4.9m) is set to join Kane in the treatment room with the midfielder being ruled out for the next two weeks following a groin strain. In better news Eric Dier (£4.7m) is available again with the midfielder having returned to full training following his bout of appendicitis. Victor Wanyama (£4.9m) has also begun his reintegration into first team training. 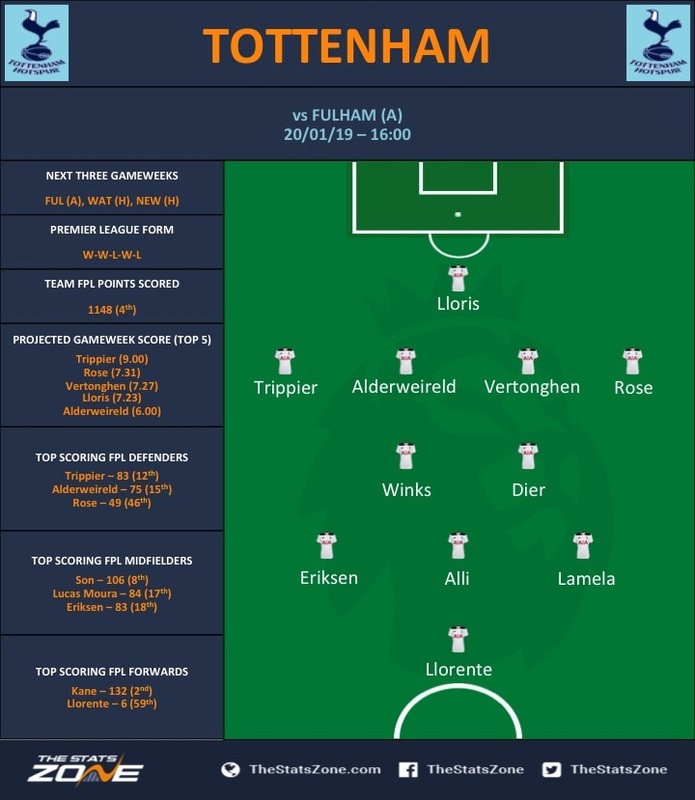 With Kane, Son and Lucas Moura (£6.8m) missing, Erik Lamela (£6.1m) is in line to get his first start in six. Will Hughes (£4.9m) is set to miss the Hornets’ home clash with Burnley after suffering concussion last weekend. Javi Gracia said on Thursday: “We'll see what happens with Will because after the last game, he is not training. We need to wait and see his evolution, but it's difficult in this moment. He is not training in this moment, but maybe we will see with a good evolution in the next days. 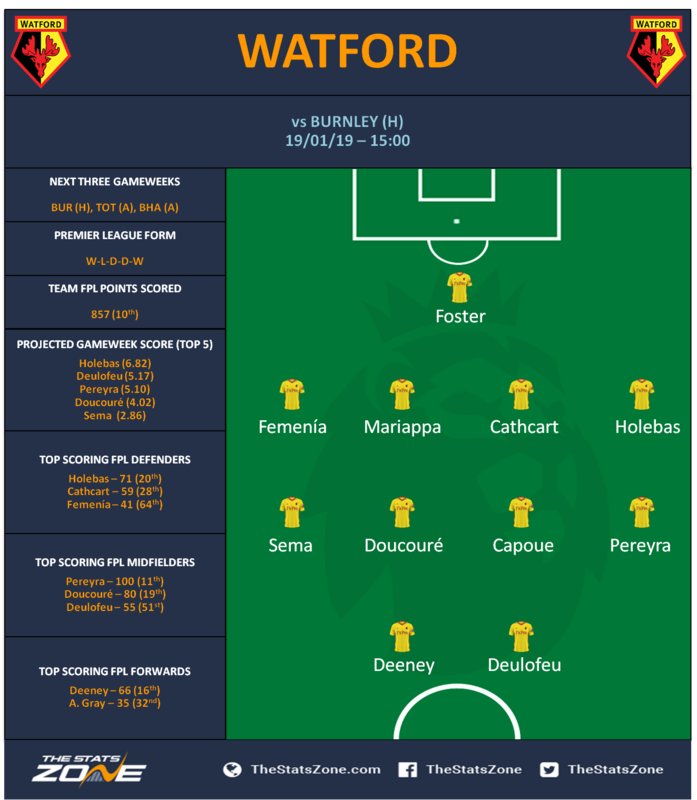 But playing in two days’ time, I am not optimistic.” Ken Sema (£4.6m) replaced the Englishman at Selhurst Park and could make an immediate return to the Watford starting XI. Marko Arnautovic (£6.9m) is also in first-team training amid rumours of an exit from the club. 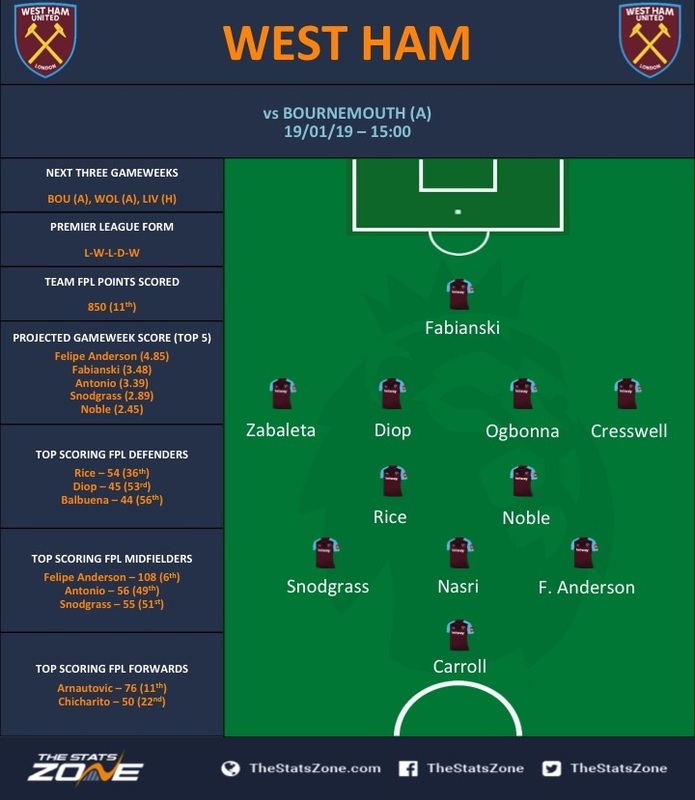 On the striker, the West Ham boss added: “Marko is working with the team without any problem.” UPDATE: It has been widely reported that Arnautovic has been dropped for the match against Bournemouth. Wolves will be without Willy Boly (£4.6m) for the visit of Leicester following his red card last time out against Manchester City. The defender will be sorely missed having played every minute of every EPL match up to his red card. Romain Saïss (£4.2m) is most likely to step in for Boly.